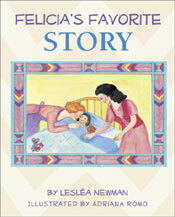 It’s bedtime, but before Felicia goes to sleep she wants to hear her favorite story, the story of how she was adopted by Mama Linda and Mama Nessa. And so Felicia’s parents tell her how they flew off in a big silver airplane to meet the baby girl who was waiting for them, and how they loved her from the very first moment they saw her. A soothing lullaby of a story that children will want to hear again and again.